Propagating and raising tropical marine fishes in captivity is challenging. In many cases, scientists and aquaculturists must find a way to duplicate the conditions on a tropical reef half way around the world, in an aquarium under a roof with no ocean in sight. Researchers have to mimic equatorial light conditions and water quality found in tropical reefs to trigger spawning. After that milestone is reached, scientists are tasked with providing a steady supply of food for tiny larvae with even smaller mouths, all of which changes as the larval fish grow into juveniles over the next few months. Why go through all this? Development of new marine aquaculture species provides opportunities for Florida fish farmers and marine hobbyists. From an environmental perspective, developing the methods to raise some tropical fishes in captivity reduces the chance that wild populations are over-harvested. In extreme cases, captive-reared populations of imperiled species are “assurance colonies” and may serve as a source to re-stock areas where native fishes have been severely depleted. 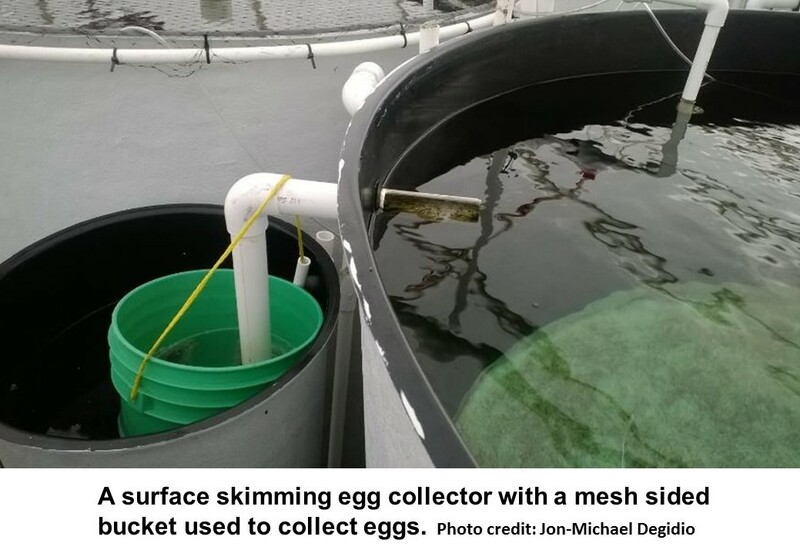 In this feature, recent graduate Jon-Michael Degidio describes continuing research challenges to the staff at the University of Florida’s Tropical Aquaculture Laboratory in a project to develop culture methods for two popular species of marine tropical fish. Aquaculture is an ever evolving industry, combining the latest technology, scientific findings, and continuing traditions passed from generation to generation, to raise a product. Marine ornamental aquaculture research and development poses many challenges. There is a lot of trial and even more error when investigating the techniques needed to make farm production feasible. At University of Florida’s Tropical Aquaculture Lab the most recent research has been focused on butterflyfish and surgeonfish, two families of tropical fish popular in the aquarium industry. Research on these species is full of hardship and frustration. These species have small egg sizes less than 1 mm in diameter, hatch in approximately 24 hours, and are 1-1.5 mm at hatch. Larvae do not have developed eyes, mouths, or digestive tracts until 3-4 days post hatch (dph). 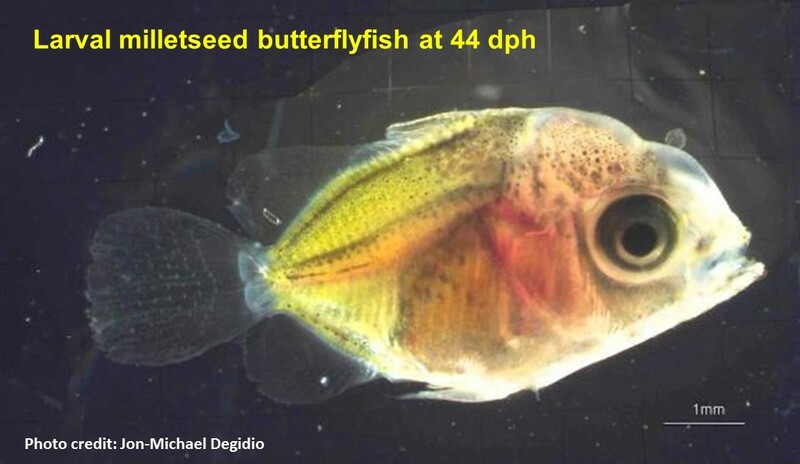 Butterflyfish and surgeonfish larvae spend up to 100 days drifting in open waters, feeding on small zooplankton. 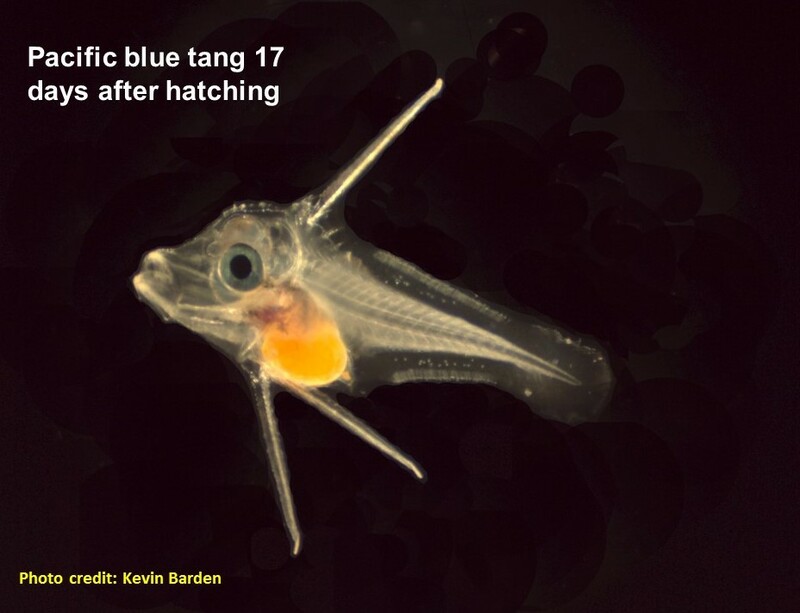 Large numbers of these larval fish die as they first begin to feed and during their development into juveniles. 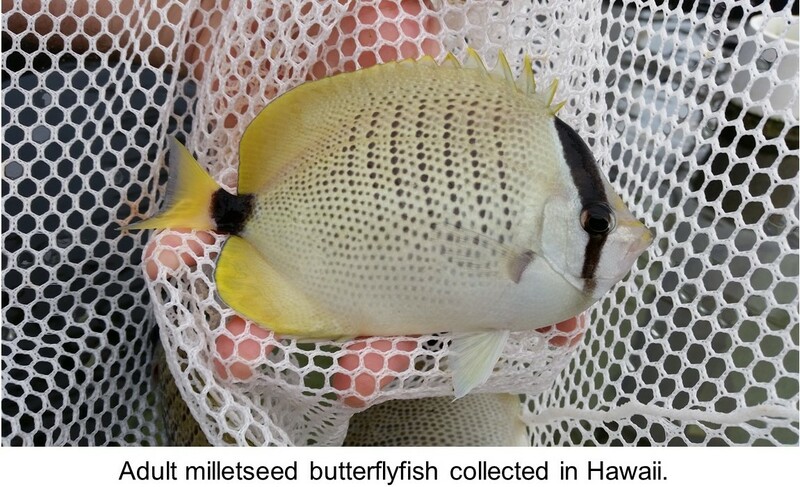 The milletseed butterflyfish was selected as a species to investigate butterflyfish aquaculture. This species is native to the Hawaiian Islands and gets its name from the rows of vertical dots along its sides. Our butterflyfish began spawning on their own, with the first eggs collected at the end of 2013. However, several preliminary rearing trials using techniques that worked on other species were unsuccessful. We conducted multiple experiments to examine fecundity (the number of viable eggs being produced by each breeding female), egg quality (the sizeof eggs) and morphological measurements, hatching success, and early larval survival. After larvae were capable of feeding, the trial and error began. We conducted repeated experiments in small tanks under the same conditions to determine some of the critical parameters for feeding, growth and survival, including what prey the larvae would eat, optimal prey density, number of larvae per tank, and green water vs. clear water. We have succeeded in raising milletseed butterflyfish for 44 days. 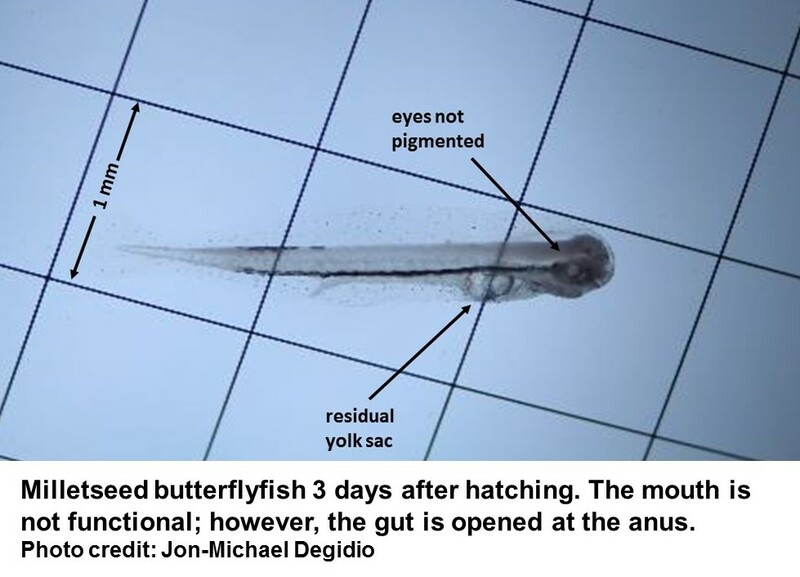 Along the way, large numbers of larvae died at swim bladder inflation, during flexion (development of the backbone), and in their rapid growth stage at 35 days post-hatching (dph). TAL staff is continuing the research to assess what adjustments are required to raise this species to a commercially viable size. Surgeonfish are coral reef fish found in primarily in the Indo-Pacific with a few species from the tropical waters of the Atlantic Ocean. Certain species, such as the Pacific blue tang, have been extremely difficult to work with. In our trials, larvae seldom survive past 10 dph, with the longest run reaching 20 dph. 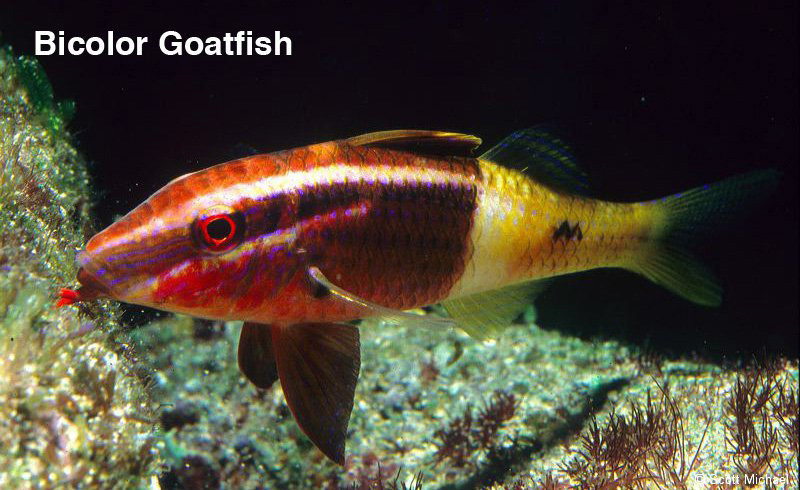 Our challenge is to decipher the sequence of events in the early life of these fishes that evolved in a complex reef environment. One by one factors are eliminated to determine what causes mortality until the culprit is found. We can manipulate physical parameters such as temperature, length of artificial daylight, water exchange rates, and prey items. However, the smaller factors, such as bacterial types and counts, are extremely difficult to document and adjust. Research is now focused on tweaking the environmental and nutritional factors in these critical early life stages, which may lead to stronger eggs and larvae. 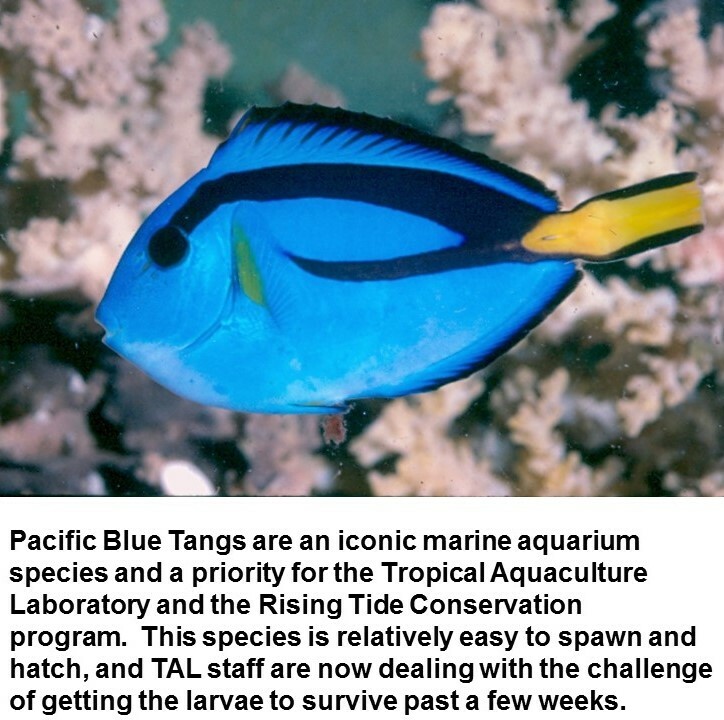 Over the coming months, we plan to continue trials to unravel the web of events and take the Pacific blue tang from eggs to swimming juveniles.